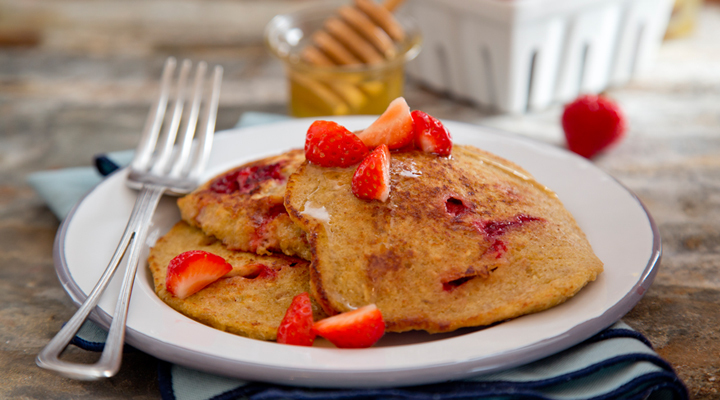 These pancakes are filling, hugely nutritious and a great way to start the day. Combine with peanut butter, fresh fruit and a drizzle of honey for the greatest enjoyment. If you have some left over, they can even double up as a snack for later in the day. Blitz the eggs, banana, oats, flaxseeds and honey in a food processor or blender until well combined. Stir in the berries and any other desired ingredients, such as a pinch of ground cinnamon, dried fruit or even some ground almonds. Melt the butter in a frying pan set over a high heat, then add in spoonfuls of the batter. Cook for 4 minutes on each side, until golden brown. Serve straight away, while still warm. Tip: Add a pinch of ground cinnamon for even more antioxidants and flavour.